JILLIAN BOEHME is known to the online writing community as Authoress, hostess of Miss Snark’s First Victim, a blog for aspiring authors. Our guest blog this week, part of our From The Writers’ Tool Chest resources, is an article by soon-to-be published YA fantasy author Jillian Boehme. Her first published novel, Stormrise, will come out with Tor Teen in September. Once upon a time, I swore I couldn’t write novels. Then one day I read a children’s novel and absolutely hated it—and had the notion that I could, perhaps, do better. Fiction was, after all, my go-to for reading pleasure. Especially fantasy. So I wrote a YA fantasy novel, and oh, what a glorious mess it was. I didn’t realize it was a mess, though, and I gleefully passed chapter after chapter to my two oldest children, who devoured it and created fan art and GIFS and wrote letters to my characters. Just the fuel a write-at-home mom needs to keep the literary fire burning, yes? I wrote a second novel. And a third. In 2008, I started Miss Snark’s First Victim, a blog for aspiring authors. 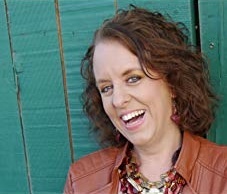 It was a wonderful way to connect with the vibrant community of writers online, offering them encouragement and advice while continuing to press forward with my own journey. The in-house critique sessions and Secret Agent Contests (with a “secret” guest agent critiquing each entry and offering requests to the winners) created an environment in which participants were not only growing as writers, but also were landing agents—and eventually book deals. Imagine the headiness of watching other people’s success unfolding as a result of the blog! And imagine the sense, as the months and years continued to pass, of being left behind, as my colleagues went on to publish their debut novels while I continued to despair of ever landing an agent. Sometimes I cried. Sometimes I declared that I was giving up (my husband never let me get away with that one). But always I kept going. Kept writing. Kept dreaming. After five (long) years, I finally signed with an agent, who had fallen in love with my YA science fiction novel and was eager to sell it. Midway through my time with him, my agent hired an assistant who became involved with the editing process of my novels. I loved her immediately! She was bright and talented and very soon began to take on clients of her own. By this time, I was on my fourth novel-on-submission (which also didn’t sell). My new manuscript was a YA fantasy, and I was concerned that my agent wouldn’t be a good fit for it—he didn’t represent fantasy. His assistant, however, did. And so I asked him, over a sushi lunch in New York City, if perhaps Danielle could take over my next project. He gave me an enthusiastic yes, and several months later, with a completed draft in hand, my relationship with Danielle was formalized. Five years and four unsold novels later, I was ready for a fresh start. My season of waiting wasn’t over, though; the YA fantasy didn’t sell, either, bringing my unsold total to five. Not a very impressive track record. And an interesting thing happened at this point: I stopped dreaming. I didn’t stop writing. I didn’t stop doing everything I needed to do to make sure my next novel was the best it could be. But the wild-hearted hope for a book sale—and a future as a published author—had died. Instead, I plugged on with the doggedness of someone who keeps going because there’s nothing else to do. Quitting was never an option. And the novel I wrote without dreaming was the one that sold. Danielle cried more than I did during the big phone call; I think I was too stunned to feel the moment. Twelve years. Two agents. Five unsold novels. Honestly? I wouldn’t trade my journey for anything. Over the lifetime of my blog (which I still run), many of my readers were encouraged to keep writing—to never give up—because I kept writing and never gave up. And, let’s be honest—it’s harder to walk away from something when people are watching you, cheering you on, waiting to celebrate your success with you. I’m thankful for who I am because of this (long!) journey; I’m thankful that I can look other writers in the eye and say, “If I could keep writing for twelve years, you can keep writing for another day.” Because it was always one day at a time, one paragraph at a time, one story at a time. Now? I’m living my dream—the one that had to die so I could be about the business of writing without emotional encumbrance. Though, really, I suppose it never actually died. Just went to sleep for a while. Is your dream sleeping? Give it a gentle poke. Your gifts, no matter what they are, were planted in you for a purpose. Making the decision not to give up will be so worth it. JILLIAN BOEHME is known to the online writing community as Authoress, hostess of Miss Snark’s First Victim, a blog for aspiring authors. In real life, she holds a degree in Music Education, sings with the Nashville Symphony Chorus, and homeschools her remaining youngster-at-home. She’s still crazy in love with her husband of more than thirty years and is happy to be surrounded by family and friends amid the rolling knolls of Middle Tennessee. 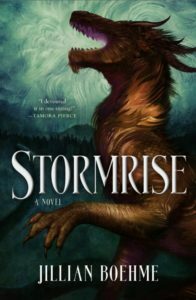 A combat warrior will risk everything to awaken the dragons and save her kingdom in Jillian Boehme’s epic YA Fantasy debut, Stormrise, inspired by Twelfth Night and perfect for fans of Tamora Pierce. Knowing she’ll be killed if she’s discovered, Rain purchases powder made from dragon magic that enables her to disguise herself as a boy. Then she hurries to the war camps, where she excels in her training―and wrestles with the voice that has taken shape inside her head. The voice of a dragon she never truly believed existed. By the power vested in my by the Internet, I hereby declare myself going off topic. Y’all. Y’ALL. The anime Made in Abyss manipulates your feelings and YOU LIKE IT. It has a super chibi/moe art style that would bother me more if it had more adult characters onscreen for longer, but since our main duo is, like, 12 years old, it passes. But if my senses had learned anything from Madoka Magica, all this cute sh*t means we are getting STABBED RIGHT IN THE KIDNEY OF OUR EMOTIONS when they break these loveable characters right in front of our faces. And I wasn’t wrong, but they did it very well. And the environments of the Abyss are inventive, and Riko is driven and adorable and resourceful and adorable and resilient as heck. And Reg the android/cyborg/something or other is strong but not nearly as resilient or decisive as Riko but still adorable and they make a good team. Maybe I’ll get to this one some day. Madoka Magica is on my list, too. I think Madoka might have even been written by the same person who wrote the novels for Fate Zero, though I don’t remember for sure. Thank you, Autumn! I absolutely love the artwork and am so thankful for it.